Things are a changin' around here, guys. My babe is about to walk, my big boy just managed to out negotiate me in a deal over LEGOs and I'm officially prepping for both of them to start school in September. They're each growing so much that we've needed to make some adjustments to our regularly scheduled programming to keep these very last (and long) Summer days running smoothly. To top it off, our little girl is ready for a brand new car seat! This Summer, our big boy has shown us that nothing makes him happier than some one-on-one time with his Dad. 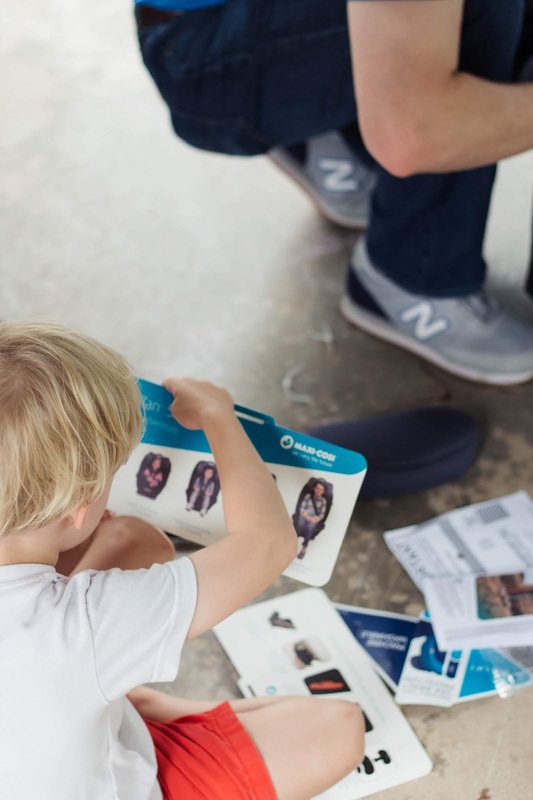 We've long since learned that we can create moments of one-on-one time over simple tasks and activities, like running a quick errand or checking chores off of our list, so we've made a conscious effort to include Gray in Big Boy things that make him shine. So with my Big Boy ready to go and a brand new Maxi-Cosi Magellan Convertible 5-in-1 Car Seat waiting to be installed for my growing girl, we set out to get things done, one brand new car seat at a time! Gray is completely head over heels for his Dad - and loves to dress like him, share adventures with him, and build the tallest towers with him. 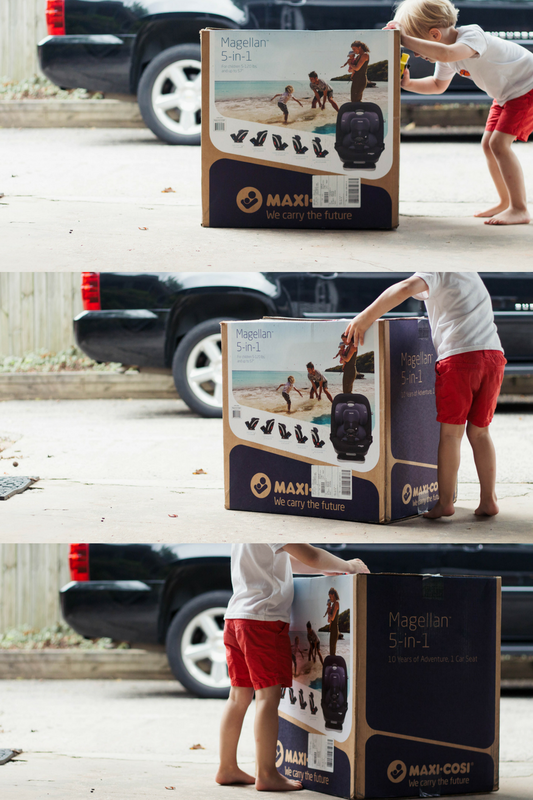 I asked Gray if he would help his dad install the new Magellan 5-in-1 Convertible Car Seat and I'm sure Justin was thrilled for the extra support. 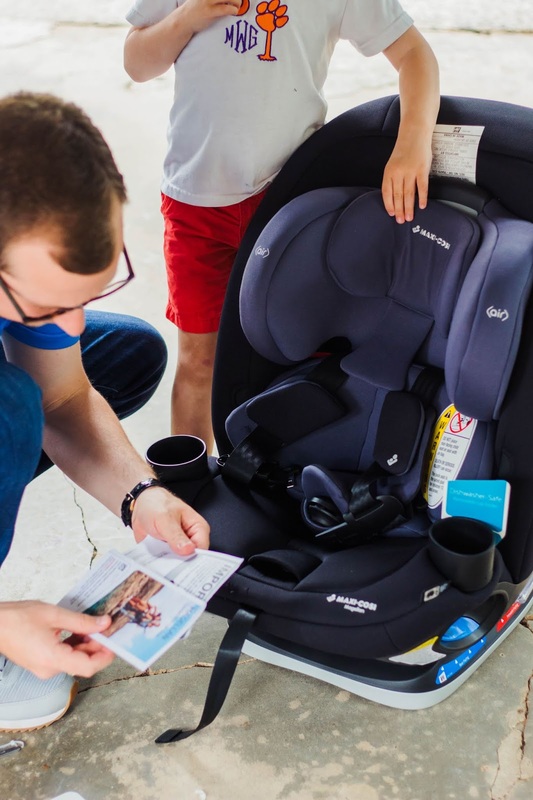 Also, let me just stop and point out that if we had owned this newest seat in the Maxi-Cosi family, we wouldn't have needed this little father/son bonding moment because the innovative 5-in-1 design can accommodate babes ages newborn to ten years old. My mind is a little boggled by that so I was super excited to see the seat come out of that box (once Gray managed to push it across the driveway, which he deemed step #1 in the install process). Is it wrong that the very first thing I noticed was the tag that says "machine washable"....only to be one upped by the other tag that says "dishwasher safe"? 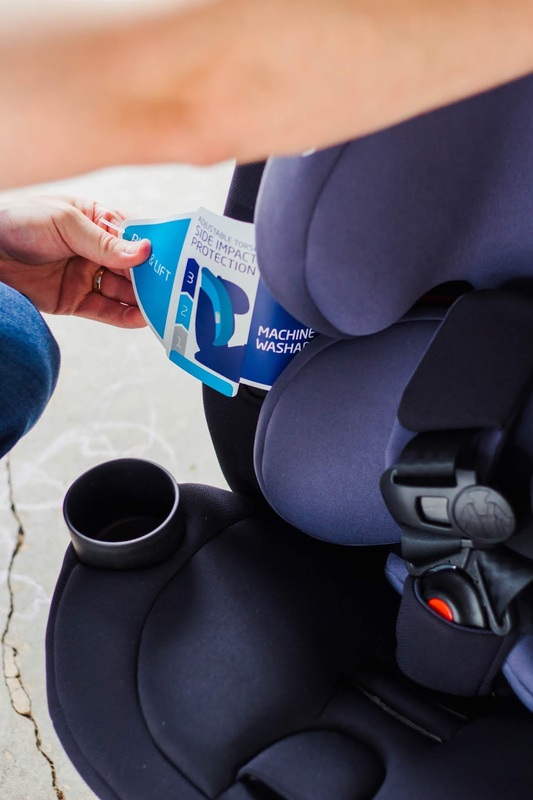 The entire fabric cover of the Magellan 5-in-1 Convertible Car Seat is machine washable and the cup holders can be popped out and tossed in the dishwasher! After the guys read over the installation guides, we determined that Georgia was still in the infant classification for the Magellan 5-in-1 Convertible Car Seat, thanks to her petite weigh in at our last pediatrician's visit, and got straight to the business of installing that bad boy. I'm telling you, every single thing Justin does, Gray follows, and it melts me. He sat right down and read the manuals just as Justin did, all to make sure that his "Sissa" (Gray speak for "Sissy") is safe on our road trip adventures. We knew we would choose a Maxi-Cosi car seat once Georgia grew out of her infant seat as Gray has one and has rocked it since he was her age. Maxi-Cosi seats have a patented Adjustable Side Impact Protection which creates max protection around your babe. 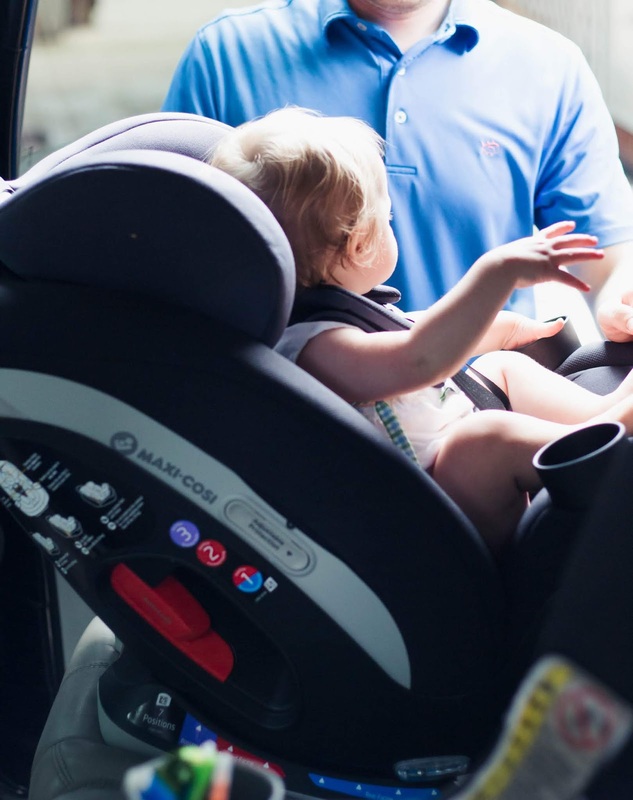 The seat can be used from 5lbs up until your kiddo weighs 120 lbs and has multiple settings for rear-facing through the toddler years. Installation was super efficient - honestly, wrangling her squirmy self into the seat to get her straps just right was the hardest part, as any mother of a toddler knows! 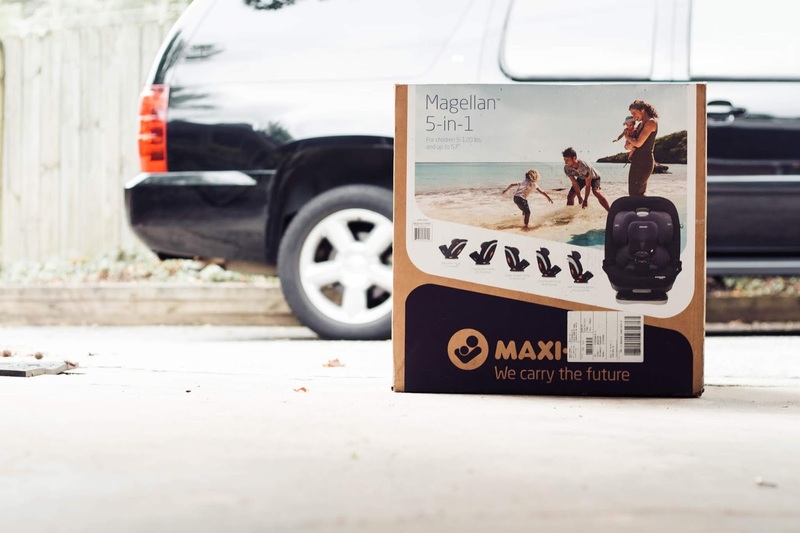 You can snag the Maxi-Cosi Magellan 5-in-1 Convertible Car Seat (retail price $349.99) at Amazon, Target.com, Buy Buy Baby, Nordstrom.com, and Albee Baby.